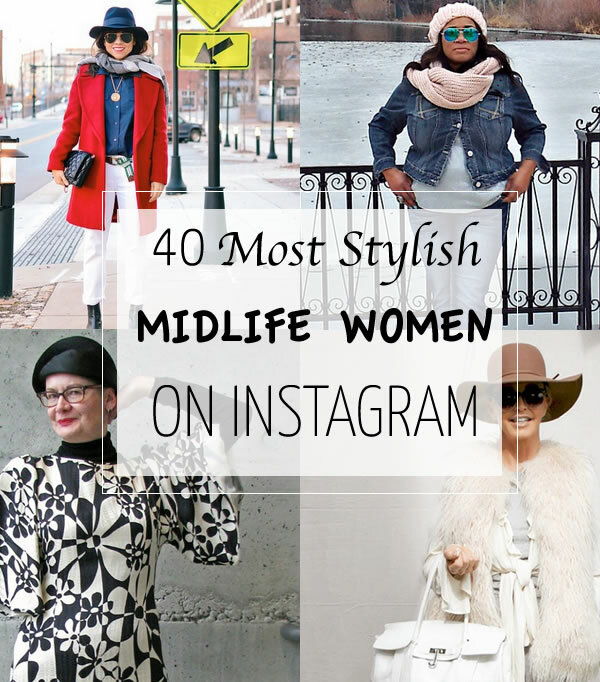 40+ Style » Style » The 40 most stylish midlife women on Instagram you should follow right now! The 40 most stylish midlife women on Instagram you should follow right now! Senior celebrities, bloggers and instagrammers have been getting a lot of attention lately on major websites and high profile advertising campaigns. I think it’s great that senior women are getting increasingly featured and highlighted, but let’s not forget about midlife women either! So today, I want to highlight the fabulous and stylish women who are in the middle phase of their life. They dress in a variety of styles, from casual to work-ready to artistic to bohemian. Quite a few of them have been featured at 40+Style in style interviews and I have added links to those articles as well. So here they are. The 40 most stylish midlife women on Instagram (in no particular order) that regularly feature their own outfits! Finally, there is my own instagram, which I cheekily added to the list. I don’t claim to be one of the most stylish midlife women but you will find a multitude of stylish 40+ women featured here! Are you following already? Undoubtedly, I missed quite a few stylish women and this list is not conclusive. I’m happy to add to it later on or create an additional list, so please let me know which other women should be included. Feel free to nominate yourself! Be sure to tag your photos with #40plusstyle we we can all admire eachother’s style and I can spot you. Do you use and enjoy instagram? Who is your favorite instagrammer? Glam Up Your Lifestyle is my Fav! Fantastic list. I follow quite a number of those lovely and stylish ladies, and looks like I need to add a few more to my list that I follow! Great list! and Thank-you! It’s hard to find women of my age on Instagram – can’t wait to follow all these stylish ladies! Thanks so much Sylvia for sharing this list of fashionable ladies and it’s an honor for me to be included. Thanks so much. What a great compilation of women! What I like about the list is that it doesn’t focus on older women who dress “in costume.” As much as I admire Advanced Style for its focus on older women, I feel like he showcases eccentricity more than style. OMG! I’m SO thrilled to be on this list with these fab ladies! Sylvia, thank you so much for including me! I’m honored to be in the company of these stylish women! Ohhhh thank you – I’m on your list… and this is a honor for me. Because there are so wonderful and gorgeous ladys as you and I’m very happy to be a part of it. I’m getting started (lurking) on Instagram so thank you for all the great feeds to follow, including yours! Sylvia! You beat me to the punch and I LOVE your picks. Firstly, am honored for the inclusion (thank you!) but even more pleased is the incredible range of picks of your 40+ Style ladies on IG. There are all shapes, sizes, style personalities, and nationalities, not the same old same old, no offense to the Buzz Feed round up (as many of my faves are on there) but there is a wider range of +40s than the ones who seem to get all the press. You really picks some great, quietly stylish folks just doing their thing. Great post, and great picks. Thanks a bunch! Sylvia, I’m thrilled to be included in this list of stylish older women. Your timing is perfect (and perhaps not coincidental), given the recent Buzzfeed list of “15 Senior Instagrammers to follow”. Thank you so much for all the work you do with your website and social media to promote us “older” dames, proving that we are getting better and better with age, and the 20-somethings out there have got nothing on us in terms of style. Thank you very much for this great compilation. I started following a couple of these stylish ladies and started an instagram account a few weeks ago Instagram: 40und and two of the ladies have already reacted by following me. Wow! We all deserve recognition, we are such a stylish and fabulous bunch of Ladies! Thank you so much for including me in your list. You do a great job with your blog. Sylvia, this is a great list of beautifully stylish women. There are some who I know, but a few who are new to me. All fabulous and I love the diversity! Thank you for building community and sharing these stunners with all of us. Now off to visit their IG sites!!! Fun to see lots of familiar faces. Even more fun to see new (to me) ones! Great list – I was happy to see A Key to the Armoire among them as I love her style. I also follow A Girl in Boston as well as a couple of the 60+ community including Margaret Manning “Sixty and Me” (absolutely great) and Style Crone. P.S. Another fabulous blog is Inside Out Style with Imogen Lamport where I believe you, Sylvia, were profiled a while back! Thank you so much for including me in this list. I feel so honored! I love posting my style and outfits and anything related to fashion. It’s funny. This month I will turn 43, but I’ll tell ya, aside from an achy body, I do not feel like I am in my 40s! I definitely don’t dress any different just because of my age. Perhaps working in an high school library amongst kids adds to my youthful take on life. Whatever it is, I think I will be dressing however I like until forever! I know I tweeted you a bit about the irony of this post, but I have to tell you again. Last night, as I was browsing about the web, I came across this post, but I didn’t read it. I left the tab (among a ton of others) open to read today. I was excited to have some new stylish women to follow in my Instagram feed. Imagine my delightful surprise when I saw that number 6 was me! Oh!! I am just still really happy that you considered me stylish and recommended a follow. Thank you so much Sylvia! Another side story…I woke up at 3:46. I know way too early. After using the bathroom, I should have gone back to sleep, but I looked at my phone. Wrong move! Anyway, I was so surprised by the amount of new followers I had. I thought there might be a weird scam going on or something. Well, now I know! It’s because of you, so thank you so much! I am really trying to garner an audience, and you have helped! Ok, enough from me. I just wanted to share my gratitude, shock, and pleasure in making this list. Here’s to all of us fashionable women no matter what our age. Like my coffee cup says, “Age (with a big captial A!) is a matter of feeling not a matter of age.” I love that saying, and I plan to live it!! Haven’t followed any fashion women on instagram, it’s mostly nature photography for me so far. But I’ve just added a number of these to my following list, and I can’t wait to dig in! I already like Accidental Icon, had to check that one out first! Sylvia, I am so honored to be included in this group of stylish ladies. Love that your list shows women of different backgrounds and style. I follow a few of these accounts and will need to add more to my list. Sylvia, Thank you for your taking the time to feature women of a certain age, so great to see we have a presence on Instagram. I am honored to be on your list. I look forward to meeting you and hopefully others featured in NYC this summer. I’m making my plans for New York already so stay tuned! Oh what a fabulous list! Thanks so much for including me on it. Sylvia, I have to say “Thank you”. Really, what an incredible source of mature bloggers and I admit, some of them I never came across before! What a shame, now they are part of my daily reads and definitely in my Instagram feed. Thank you also for including me, I feel very honoured and if anyone had told me 2 years ago I’d make it to such an amazing list, I would have laughed out loud! Sylvia~ What a fabulous list….some of my faves! Dear Sylvia, I could not believe my eyes when I checked my instagram today and was wondering what happened then I found out about this feature. You totally made my day. I am still smiling. Thank you so much for your kindness. You are a gem!!! Thank you Sylvia, I was surprised when I checked Instagram this morning , and then later checking your site, coming across this post. I am honoured to be amongst these other women, and a part of a group in which you consider my style and fashion taste. I have had some health issues as of late, so this was a real pick me up and put a smile on my face. I appreciate being included, love reading other’s styles and meeting wonderful ladies such as yourself. Oh no… Does that mean I have to do Instagram as well?? thank you so much for your support. It´s a big honor to be a part of it with all these fantastic women. So honored to be a part of this list. I have been looking for more 40+ fashion bloggers to follow on instagram so thank you, thank you, thank you! Wow- these are some fashion-minded mid-lifers!! Wow, this was so wonderful. I always want to look fresh but comfortable while attending events, but don’t want to spent money getting new outfits. You’ve given me some ideas and I thank you for that! Sylvia thank you so much for including me as one of your 40 – what amazing ladies I’m amongst! I’ve discovered several Instagrammers I didn’t know, and a few bloggers I knew but wasn’t already following on IG. Such a good idea for a post, and so good to show IG isn’t always just about 17 year olds taking selfies the whole time (though I am partial to/guilty of selfies myself)! My Instagram idols are mainly dogs;-). Harlow and Sage is number 1, Ginny_jrt is number 2. I like the account of woodlucker. It’s an artist couple and the woman used to be a fashion blogger. Their account, content and pictures are awesome! I follow projecttribe, for their ethnic fashion, the beautiful light and colors and the perfect pictures. Poppylissiman is outrageous and colorful, as is Bambisplace. I follow quite a few of these stylish ladies too! I am also on instagram @whosaprettygirl featuring my thrifted fashion. Thank you very much dear Sylvia! I am honored to be a part of this list. All the ladies are amazing. And I will follow all on instagram. I would like to express my satisfaction when I see how many women over 40’s and 50’s love to share their lives and the issues that affect all of us. Being an influencer over 50 myself I feel very proud of all these powerful women. Next post: Having more fun with prints – Choose your favorite from these 12 fabulous looks! How lovely to have you here! At 40+Style we help women find and ignite their style after 40. Find inspiration from other 40+ women, check out our tips on how to dress after 40 and find out how to find your unique style. To start your style journey download our style guide!. Most of all, we have lots of fun here so I hope you enjoy the many articles!